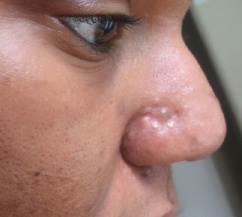 A combination of hypertrophic scars and sebaceous hyperplasia. Will be starting a low mg dose of Roaccutane in Oct 2006 to see if this shrinks the oil glands. (July 2006).